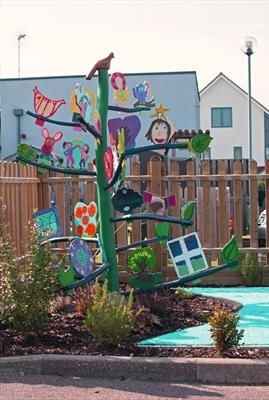 A sculptural tree built to carry the artwork made by pupils of Broughton Fields Primary School in May 2014. The plywood shapes onto which the children carved their designs were derived from templates created by them to depict the twenty two values embedded in the life of the school. The tree is now sited in the Values Garden, a memorial to the Deputy Head who died earlier this year.